Trekking, Jungle and Biking tours: Bioandean Expeditions operates in regions where standards of accommodation, transport and services might not be those you would normally expect. However we strive, with all due care and skill, to provide the best services for our tourists. Travelling in Peru requires flexibility, patience, broad-mindedness, good humor and understanding that changes may be made without notice due to circumstances beyond our control (Force Majeure – see below). By booking any of our tours you agree to BioandeanExpeditions making necessary changes without liability. Persons with medical conditions that may affect their ability to complete the trek must disclose this information prior to do the trip. Due to the nature of the trek clients will be walking at different speeds and not be together as a concentrated group. The guide will not be able to watch everyone all of the time. Every person therefore, is responsible for his or her own personal safety and must have their own suitable travel insurance. At all times the decision of the company’s biking ,trekking guide will be final on all matters likely to endanger the safety and wellbeing of the group. Should the client interfere with the wellbeing of the group then the guide may order the client to leave the group without recourse to any refund. Any liability is limited to the price paid for the trek. Staff of Professional licensed English speaking private tour guides. 1) Full Passport Details of ALL Travellers, Passport Full Names / Passport Number/ Nationality / Gender/ Age. These are required to purchase entrances to Machupicchu and Flight and Train tickets. 3) Students/Children? If you are a Student with a valid ISIC international student Card or a child 15yrs or under, then you are entitled to $20 discount off of your Entrance Fee!! At the time of making your Reservation if you are a Student we need to submit a Scanned copy of your card so please scan it in and email us a copy AND if you qualify for child discount then we need a scanned in copy of the front page of your passport please. We cannot claim discount for you without this!! Note that you need to carry your ISIC Card with you otherwise you will have to pay the full fare on entrance fees! 4) Final Balance? Your balance is payable 3 days prior to your departure date on the trail ( and it must be in cash dollars or soles ( According to the current rate in Peru). If you book within one week of departure date then full amount is due at time of reservation. Another way to do your payment from abroad and avoid high bank charges or taxes, is using WESTERN UNION, a global transfer service that has a large network of offices around the world. Money Transfer by Western Union (using your credit cards) – There are additional fees associated with this method of payment. The method of payment depends on which country that you are sending the money. From the USA, Canada, UK, Ireland, Australia, France, Netherlands & Norway you can make the money transfer online at : http://www.westernunion.com/index_consumer.asp Just visit the website and follow the instructions. Visa and Master Card can be used. The charge is less if you go directly to a local Western Union agent in your town and pay in cash. For countries other than those mentioned above you will have to go to the office of your local agent to pay the deposit. The Western Union website allows you to search for the agent nearest to where you live. There are over 245,000 agents throughout the world so you should have no problem finding one that is convenient to you. Operation and transaction numbers: Money Transfer Control Number (MTCN) / Number of 10 Number Very Important: …………………………………………….. Date and hour of the Payment:…………………………………………………. (2) Transfer into PERUVIAN BANKING ACCOUNT We can also accept payments by bank transfer to our Peru bank account. You can directly transfer funds from your own banking account to our banking account. There is a 7% admin fee attached to this account that you need to add onto the amount you are sending. See details below. The deposit must be sent under the name of MARIBEL SANCHEZ HUAMAN (you can print this page). We’ll send an E-mail confirming the transaction and we’ll re-confirm your reserve as well. Name of the bank where the transaction was done:……………………………………………….. Arrive in Cusco 3 OR 2 days before trek departure: Your arrival date in Cusco must be at least 2 days prior to trek departure since you have to pay the trek balance before 6pm, 2 days before you start the trek. Arriving 2 days prior to the trek also ensures that you are better acclimatized to the high altitude. However 3 days is recommended. Student discounts: If you are claiming a student discount you must send us a ‘JPEG’ scan of your ISIC card by email within 03 days of us accepting your booking. Only a valid ISIC card is acceptable. If you cannot provide us with a scan of your ISIC card within 3 days of us accepting your booking we will charge you the standard adult trek price. We cannot obtain the discount at a later date.There is no age limit for students. 5. If you have a hotel reservation in Cusco please include the name of your hotel on the reservation form. This allows us to locate you if there are any problems with your arrival. You will also be asked to confirm your hotel in Cusco when you come to the office to pay the trek balance. Any modifications to the original booking must be confirmed in writing via email. Any costs or charges, which we incurr or which are incurred or levied by our service providers as a result of the modification, will be charged to the passenger. Whilst every reasonable effort will be made to accommodate changes and additional requests, availability cannot be guaranteed. Deposits are non-refundable should you cancel. If you fall ill whilst in Cusco and feel that you cannot trek, but still want to go to Machupicchu – we will turn your trek program into a 2D/1N Train Package, but note that we have to use the exact same dates in order to make use of your entrances into Machupicchu, train tickets, hotel, etc. If you need to change dates then we will require extra funds to make the relevant changes to your itinerary. you need to buy a train to get to Aguas Calientes once there we will provide your entrances into Machupicchu, train back to Ollamtaytambo , hotel, and one dinner, guiding tour in Machupicchu. If you require documentation for insurance purposes Bioandean Expeditions Operator will be happy to assist you with this kind of paper. While we will endeavor to operate all tours as quoted, it may prove necessary or advisable to vary or modify an itinerary or its contents, due to prevailing local conditions. We reserve the right at any time to cancel or change any of the facilities, services or prices (including flights, accommodation or other arrangements) and to substitute alternative arrangements of comparable monetary value without compensation and accepts no liability for loss of enjoyment as a result of these changes. Bioandean Expeditions Operator reserves the right to increase the tour cost to take into account of the following items: government action, currency fluctuations, transportation costs (including the cost of fuel), food increases, airport charges and increase in scheduled air fares or any other increase that is beyond our control. Bioandean Expeditions Operator will not be liable for any charges in the event of a change beyond their control to the departure time or date of a tour, flight or other form of transport. Bioandean Expeditions Operator is not responsible for force majeure – this is war, threat of war, riots, civil strife, industrial dispute, terrorist activities, natural or disaster, fire or adverse weather conditions, technical or maintenance problems with transport, changes imposed by cancellation or rescheduling of flights by an airline, the alteration of airline or aircraft type, or other similar events beyond the control of ourselves. All participants in tours operated by Bioandean Expeditions Operator are expected to obey the laws and regulations of the countries visited and any failure to do so will relieve Bioandean Expeditions Operator of all obligations that they may otherwise have under these booking conditions. If a Passenger has a complaint about any of the tour arrangements he/she must bring it to the attention of the Guide or a representative of Bioandean Expeditions Operator at the time so that they may endeavor to rectify the situation. We can only rectify problems if we are made aware of such problems. Failure to complain immediately will prejudice the Passengers right to claim compensation. Should the problem remain unsolved a complaint must be made in writing to ourselves within no more than 14 days of the completion of the holiday. Bioandean Expeditions Operator reserves the right to modify or withdraw any travel arrangements when deemed necessary, in the best interest of the clients. We reserve the right to refuse, accept, or retain any person as a member of one of our trips. Bioandean Expeditions Operator is not responsible for injury, sickness, damage, loss, additional expenses, accidental delay or other irregularities which may be caused either through willful or negligent acts or omissions on the part of companies or individuals providing or engaged in transportation, accommodation or other services related to the accomplishment of the tour, or through natural disasters or acts of nature. Please note that we are not in control of the campsites we are issued with from the Institute of National Culture. In general your campsite allocation is dependent on how early you book, or rather, how many permits are left. The first 250 spaces are generally given to Winay Wayna (3rd campsite) and thereafter you will have a longer walk to Machupicchu on the last day and it could mean you do not make it for sunrise. Do not let this disappoint you as Machupicchu is marvellous in itself! Campsites are subject to change according to our guide’s criteria and the group progress. By participating in your trek (#) the clients accepts the terms and conditions stated above. Clauses relating to cancellation of trek come into effect directly after the trek purchase. Staying healthy during your trek. Bioandean Expeditions recommend you to be at least three or two days before you do any of our treks in order to acclimatize . Cusco is on 3,300 meter above sea level. Ensure that you are fit and healthy before commencing the trek. Allow at least 2 days in Cusco ( or similar altitude) to acclimatize to the altitude. Although many people do the trek do not expect it to be easy. Anyone with respiratory problems should not undertake this trek. Walk at your own pace. Even though you are part of a group you will not all walk together in a bunch. People walk at different rates so keep to the speed that suits. The group gets back together at the ruins or any interesting place to enable the guide to explain them to everyone. Try not to over exert yourself. If your heart is pounding rapidly in your chest stop a little and have a rest and wait until it calms down a little. Drink plenty of fluids on the trail. We’ll provide you with teas, mates and coffees at meal times but you will have to drink a lot more fluid besides these drinks. Bring a water bottle of at least 1 liter capacity per person. Don’t get sunburned. The sun at high altitude is particularly strong. Walking in shorts and T-shirts is fine but put on plenty of high factor protection and always wear a hat. When the sun goes down the temperature drops rapidly and it is easy to get a chill. Put warm clothes on. Return Train Tickets .- The return train is the Expedition train which departs either at 2.55, 4.20, 4.42,6:20 or 8.50 pm. The train that is booked depends on availabilty and is confirmed at your briefing. There is an option to upgrade your train from the Backpacker train service we included in the Price to luxury Vistadome train which is an extra US$ 80 per person. Please let us your preference at the time of booking. None of the trains go straight to Cusco, they only run either to Ollantaytambo or Poroy but in either case we will transfer you back by Private Transport to your hotel. and if you stay an extra night in aguas calientes we will purchase the train tickets for the following day at the same time but please le tus know while you book this tour. Our Camping Equipment.- We provide 4 men tents for only 2 people and inflatable (therm-a-rest) mattresses for everyone (Because we want you to sleep in Comfort). Our dining equipment includes a spacious dining tent, Portable tables and chairs, plates and utensils. We do NOT supply sleeping bags or walking sticks, but all can be rented from Bioandean Expeditions. Our Guides, Cooks and Porters.- All of them are amazing, helpful, caring, and great people to be around with. Our guides speak good English and are patient and very informative. Our cooks provide amazing family style food for you and our porters and everyone is impressed with what they can whip up in the middle of the mountains. Your porters will carry everything for you which makes your trek as easy and comfortable as possible, thanks to them you will finish your trek and have a great time. Our porters are called ´Bio Chaskis´ on the Inca Trail. And we never overload them, as most travel agencies who share service and offer extra kilos to be carry by porters with no extra cost. 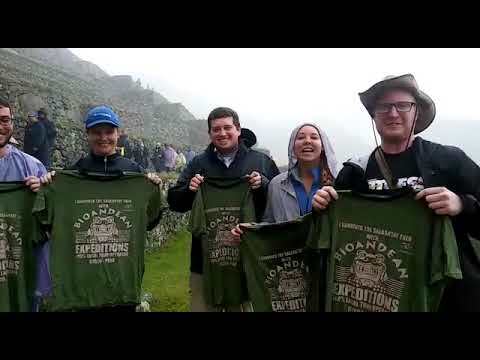 Fitness on the Treks.- The Inca Trail is certainly not easy but you do not need to be an athlete or a trekking expert to complete it. Fitness is naturally important but the Inca Trail is the kind of trek that anyone with a positive attitude and determination can do. Obviously the more fit you are the more you will enjoy the trail and the more chance you will have to take in the scenery and appreciate the Inca ruins dotted along the way. If you do not exercise regularly, it is advisable to do some extra walking or some kind of aerobic activity in the months leading up to your trip. Storage during your Trek.- During the Inca Trail trek your main luggage will be stored in Cuzco and if you have an extra porting service you will receive a small duffle bag at your Inca Trail briefing (briefings are normally set for the evening before you start the trek) to pack clothes for 3-4 days. Your team of porters will carry these bags together with the food and equipment for the trail. Please note that you will not have access to these items until the end of each day as the porters will always be ahead of the group, you should therefore bring a day pack in which you can carry personal belongings such as your camera, water and sun screen etc. By Peruvian law the duffle bag carried by the porters must not weigh more than 12kg . You can either store your luggage at your hotel or you can leave it with us. We only can confirm the reservation after recieving a Non-refundable US$200 for any Inca Trail or US$200 for any alternative Treks and 30 % for our Peru packages and others Services (Method of payments Western Union, Moneygram and bank Transfer) Please note that the program deposit is non-refundable. The deposit is used to purchase the ticket entrance to Machupicchu and also for booking the train ticket and hotels. And once a space is purchased it cannot be resold. And if you want an extra porter you have send us 50% as well. The Final Balance must paid 3or 2 days before we Start the Trek/Tour(and it must be in cash in dollars or soles), otherwise we will cancel the tour unless you send us an email saying that you will have a delay.